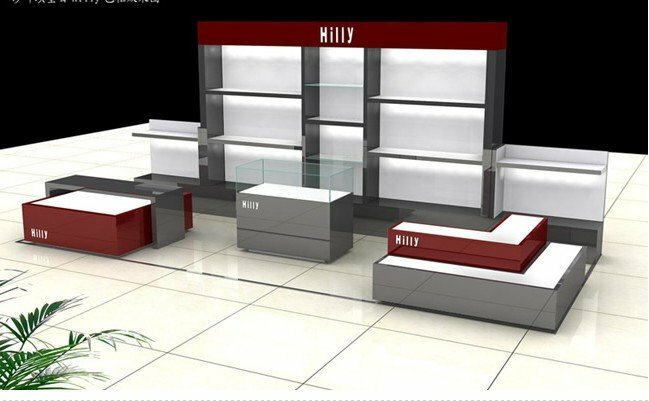 This is a Shoes & Handbags display kiosk design concept used in shopping mall. The best usage of this kiosk design is side wall locations or corner locations where the back against a wall. 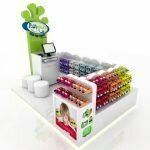 With high back wall cabinet and shelf display, you can display your products in a higher shelf to attract your customer. The size of this kiosk design is 5*2.5 meter square space. On the front two corners are display stands and led backlit. So you can display some good design shoes or handbags. Because of the display shelves in the back. 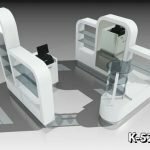 This kiosk design can also used in a pillow kiosk retail or bed products display. Dark grey and dark red color are main combination of this kiosk. With white display background make this kiosk in a very good design concept. You can display almost whatever bigger products. When opening a shoe & bags retail kiosk or retail store in mall. This design concept and display ideas will help you prepare your plan. if you are looking for a high quality kiosk with affordable price. Welcome contact us design team.